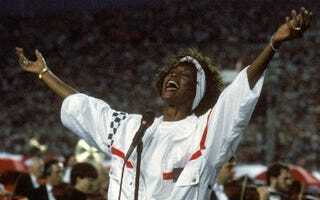 Best and worst national-anthem performances: You can guess which list Whitney Houston's Super Bowl version is on. Watch the rest of them here. Steel Magnolias with a black cast: The latest remake of the film has been in production with Queen Latifah, Jill Scott, Phylicia Rashad, Alfre Woodard and Condola Rashad working to revamp the movie. The first look at the movie came out on Tuesday in a trailer. Black pastors press Obama for gay-marriage meeting: The group wants him to discuss his stance, and they plan to "turn up the heat," according to the Christian Post. Something tells us it's not going to get hot enough to change the president's mind on this issue. When black and Latino politicians are pitted against each other: NBC Latino explores the complicated political and identity issues at play in Charlie Rangel and Adriano Espaillat's primary race.